Seawolf sports update, Feb. 22-28: Men's and women's basketball get ready for CCAA Tournament; baseball continues winning in best start since 2013; women's tennis wins two matches; men's tennis loses another; women's softball wins multiple games; women's golf takes third place at tourney; men's golf takes second place at tourney; women's soccer assistant coach Robin Hart named coach at Menlo College. For the first time since 2012, the Sonoma State University men's basketball team will host a first round game in the California Collegiate Athletic Association (CCAA) Tournament. 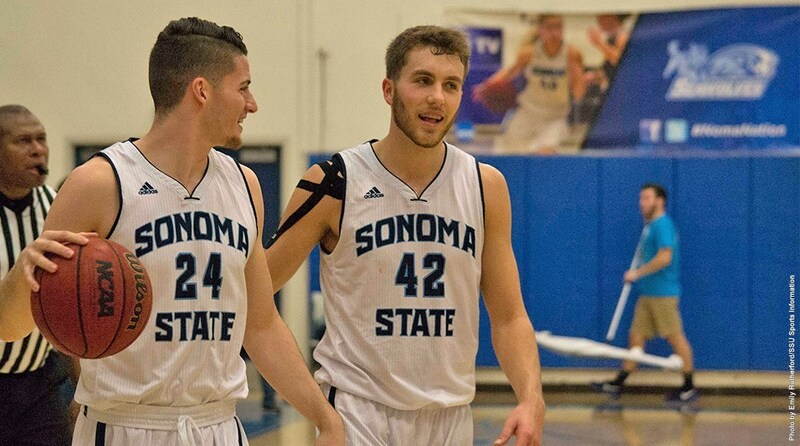 Sonoma State (3) plays Cal Poly Pomona (7) at the Wolves' Den Tuesday, Feb. 28 at 7 p.m. The winner of Tuesday's game will play on Friday, March 3 at 8 p.m. at the Sports Center in San Marcos against the winner of the Cal State Los Angeles (7) vs. San Francisco State (2) matchup. The championship game is Saturday, Mar. 4 at 7:30 p.m. at the Sports Center. At 18-6 overall and 14-4 in the CCAA, the Seawolves are having one of the best seasons in school history. The team boasts the top-ranked defense in the nation, yielding just 57.1 points per game. General admission tickets are $8; faculty and staff, members of the armed forces (with ID), and seniors are $5; visiting students and children 12 and under are $2. The first 500 SSU students receive free admission. Advance ticket sales are not available for students; tickets can be picked up at the Wolves' Den starting at 6 p.m. on game day. As this is a CCAA event, no SSU or SSAA season passes will be accepted for admission. Follow the action online at SonomaSeawolves.com/live. The Sonoma State men's basketball team suffered a 55-51 setback against Cal Poly Pomona in the regular season finale Feb. 25 in Pomona, but the Seawolves and Broncos are set for a rematch Feb. 28 at 7 p.m. in the Wolves' Den in the first round of the CCAA Men's Basketball Championship Tournament. Down by 15 points with 19 minutes to go in the game, Luke Cochran's thunderous dunk ignited the Sonoma State men's basketball team to finish the game on an impressive 36-12 run, effectively turning out the lights against Humboldt State and its "black out" crowd of 884 for a stunning 65-56 victory Feb. 23 at Lumberjack Arena in Arcata. Sonoma State split a conference double header with San Francisco State on Feb. 26. Sonoma won game one, 9-1, and lost game two, 5-4, in a walk-off single. Jake Sahagian was 5 for 8 and had one home run. Sonoma improves to 6-1 overall and 3-1 in the CCAA. Sonoma State opened CCAA play winning both games in the Feb. 24 double-header against San Francisco State. The Seawolves won the first game, 4-1, and the second, 5-2. After suffering a 9-5 loss in game one, the Sonoma State softball team rebounded for a 4-1 victory in game two on Feb. 24 to take three out of four games from visiting Stanislaus State at the Seawolf Softball Field in Rohnert Park. The Seawolves improve to 8-5 overall and 4-4 in the CCAA. Jenny Collazo went 4 for 8 with a double, triple, two walks and two RBI in two games, and after a quick 5-4 win in game one, Sarah Langley lifted a walkoff sacrifice fly in the bottom of the 12th inning for the Sonoma State softball team's second 5-4 victory of the day over visiting Stanislaus State on Feb. 21 at the Seawolf Softball Field. Robin Hart, top assistant coach of the Sonoma State women's soccer program the past two seasons, has been named the head coach at Menlo College in Atherton. During her two seasons with the Seawolves, she helped guide the team to a 26-6-6 record, a league championship in 2015, and back-to-back NCAA Tournament appearances. The Seawolves lost their last regular season conference game to Cal Poly Pomona, 49-45. Madison Burroughs (13), McKaiela Tyler (11) and Carly Gill (9) were the leading scorers for Sonoma. Sonoma State falls 9-11 in the CCAA and 13-13 on the entire season. With the Feb. 23 victory over Humboldt State, Sonoma State women's basketball has the most wins since 2008. Once again, the Seawolves made their free throws count, making 15 for 20, with 18 of those shots taken in the second half. After a victory at Dominican on Feb. 24, the Seawolves handedly defeated the Warriors on Feb. 25, 7-2. Sonoma State improves to 5-4 this season. No. 23 Sonoma State topped Dominican University 7-2 on Feb. 24. All Sonoma doubles won their matches and Hillary Fazekas and Katherine Long swept theirs. The Sonoma State University Men's Tennis team fell to No. 22 Point Loma Nazarene in San Diego, 8-1, on Feb. 25. The Seawolves fall to 0-5 on the season. Haley Whitbeck followed up her round of 75 with a 76 on Feb. 21 to finish seventh in a very strong field of 100 at the CBU Invitational at Eagle Glen Golf Club in Corona. The senior's performance led the Seawolves to a third place finish in the team competition, just one stroke behind second place Cal State San Marcos. Riding the career-best rounds of Ian Hofmann and Spencer Clapp, the Sonoma State men's golf team cruised to a second place finish out of 10 teams at the Tim Tierney Pioneer Shootout Feb. 24-25, hosted by Cal State East Bay at Hiddenbrooke Golf Club in Vallejo.